Deaden is a film that has caused some degree of controversy and this is mostly because of what happens in the first eight minutes. If you describe the movie as brutally violent this would be a dramatic understatement. The film is so violent in its first few moments that people have walked out of the theatre before giving the film a chance. The writer of the film, John Fallon, has said that he would like people to give the film more of a chance and promises that after the first eight minutes it becomes more mellow. This is a film about revenge that has been created on a very small budget and it very much goes to show that a film does not need a huge budget to be memorable. After the first eight minutes it does start to calm down, but only in comparison to those first eight minutes. It is still a very brutal film that many people will find hard to watch. The killings that occur in the film are part of a revenge plot and sometimes they are so brutal that it seems these killings simply go beyond the name of revenge. The killings throughout the movie are incredibly disturbing, but none of them are really as intense as the first few moments of the film. The film has been created for a small amount of money, therefore it should not be compared to Hollywood blockbusters. The production quality for the amount of money spent is very good, and if you bear the budget in mind when watching the film you will probably enjoy it. It is also nice to see a break from the banality of big budget blockbusters that have become so mundane in recent years. Those who watch the film will probably be wondering what Mr Fallon would be capable of should he be given a Hollywood budget. Unfortunately, it is unlikely that this will ever happen because Hollywood is far too focused on creating films which it sees as financially safe, such as sequels and remakes. It is generally quite hard to find independent movies because they simply don’t get the same level of distribution, Deaden, however, is a film that you should definitely check out. 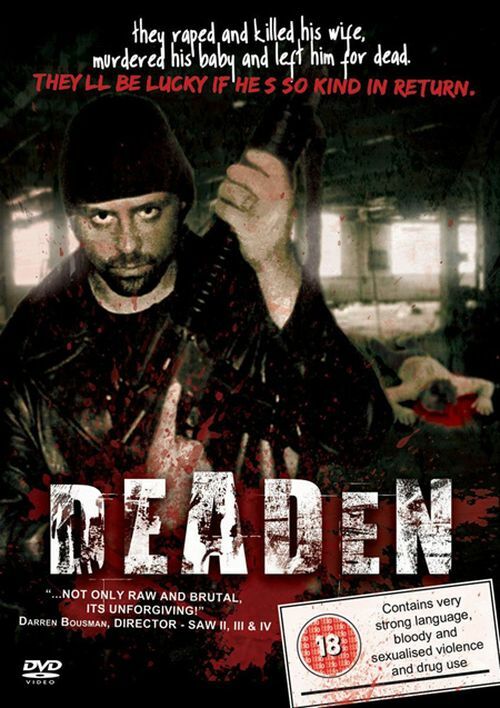 This entry was posted in Horror, Movie Review, Movie Trailer and tagged Controversial violent movie, Deaden review, Deaden trailer, Deaden' brutally violent, John Fallon. Bookmark the permalink.